Aling-Aling waterfalls in the North of Bali are called twin waterfalls as they are split at the top leaving two streams that fall at completely different speed. 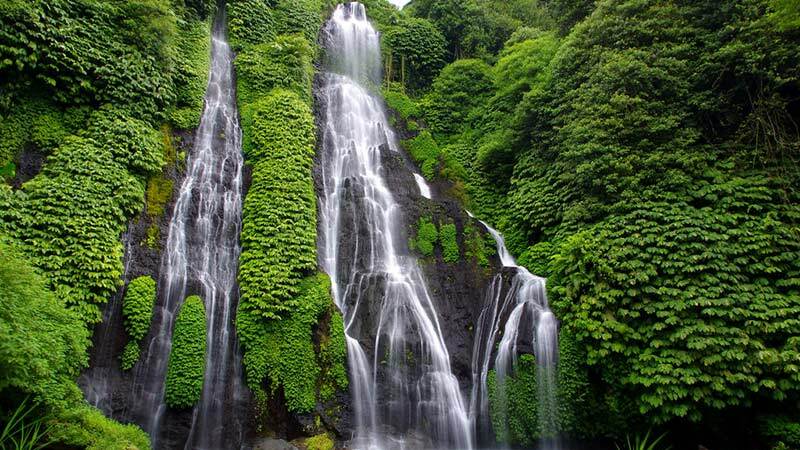 The 35 meter tall waterfalls, one of the tallest in Bali, are well worth the long and steep walk down. What will be waiting for you is not just a beautiful view, but also a small lagoon for swimming, a cliff jumping spot and natural water slides. Location: North of Bali, in the village of Sambangan, approximately 10 kilometers from Singaraja and 80 kilometers from Denpasar. 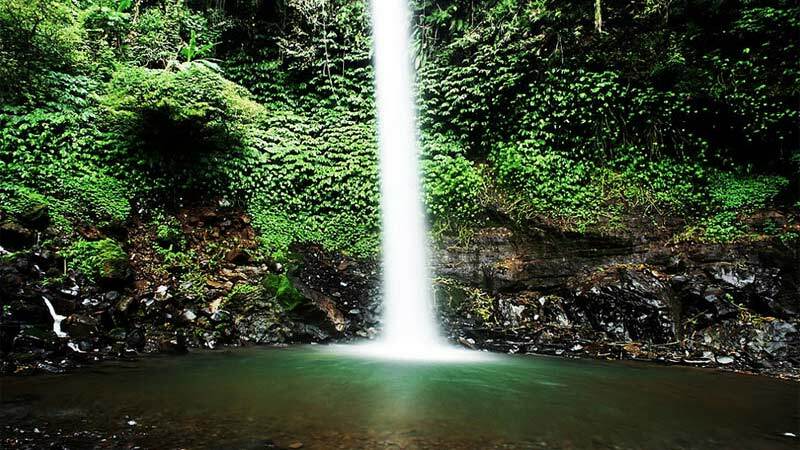 In the Sambangan area, within a short distance from Aling-Aling and each other, you can also find 6 other waterfalls: Pucuk, Kembar, Kroya, Canging, Dedari and Cemara. A hidden gem of the North, located up in the forested hills of Cempaka village in Banjar district (Buleleng regency). There is a clear path from the village to the waterfalls but sometimes it might still make sense to ask the villagers for help. This waterfall is not very high or large but it feels like a sanctuary with birdsong and nature sounds as a backbeat to soaking in a rocky pool at the bottom of the waterfall or in one of the lava stone pools in the upper creek. 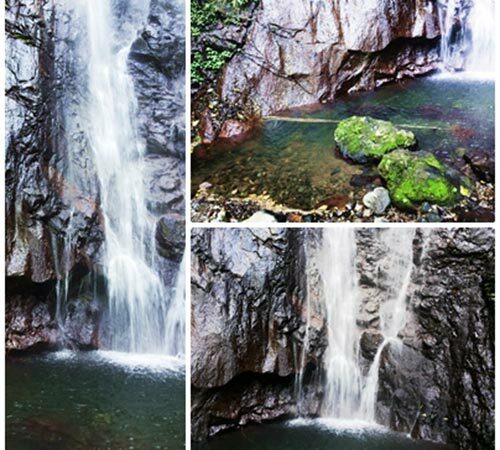 Best time to visit is the wet season (Oct-Apr) as during the dry season the waterfall might be reduced to trickles. Location: North of Bali, in the village of Cempaka, 50 kilometers West of Lovina (Jalan Air Terjun Sing-Sing) and 80 kilometers from Denpasar. This waterfall is one of the truly hidden Bali waterfalls and unknown to most. Located in the Bangli regency, it is 25 meters tall and feeds the Melangit river. It can be reached by a 500 metre walk from Taman Bali village. The waterfall is surrounded by lush greenness, fresh and cool air and animals, such as long-tail macaques, that roam free. Location: In Taman Bali village approximately 6 kilometers South of Bangli town and 35 kilometers from Denpasar. 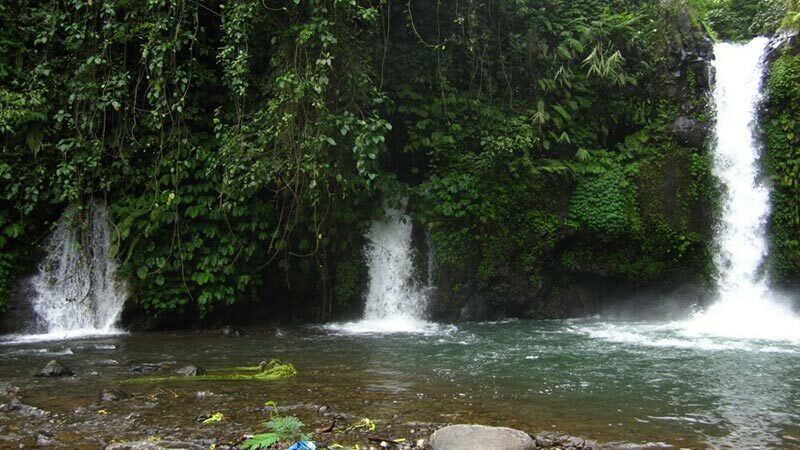 Located in Ambengan village, Buleleng regency, close to the well-known GitGit waterfall lies the hidden gem of northern Bali. Not many tourists have yet found their way here but locals consider Jembong to be the best of Bali waterfalls. Although the signage to the waterfall might not be clear, it is not difficult to find your way there. The gentle sloped beauty is surrounded by cacao plantations and tropical trees, and due to the calm atmosphere it is a perfect spot for spiritual healing. Location: In Ambengan village, Sukasada, Buleleng. 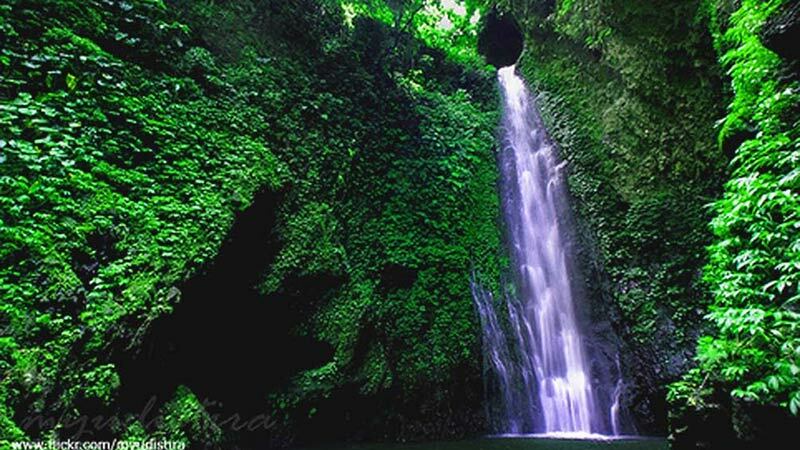 A 70 kilometer drive from Denpasar towards Singaraja, passing GitGit waterfall on the way. If you´re looking for a challenge, Sekumpul waterfall in Singaraja regency should be the waterfall of your choice. It will take a dirt road, many slippery steps and the crossing of a river to get there but it´s well worth the effort, and you get to walk through bamboo forests as well. What´s special about Sekumpul is that there are actually seven waterfalls of different heights (up to 80 meters) and varying water flows. It might make sense to pay a local to take you to the top, from where you´ll have the best view of the surroundings. Note: At the entrance you might run into touts trying to sell you a compulsory tour for Rp. 200 000. Don´t fall for this scam. The only thing you should pay is the entrance fee of Rp. 10 000. Location: In Sekumpul village in Singaraja, there will be signs for the location. The distance from Denpasar is about 70 kilometers. 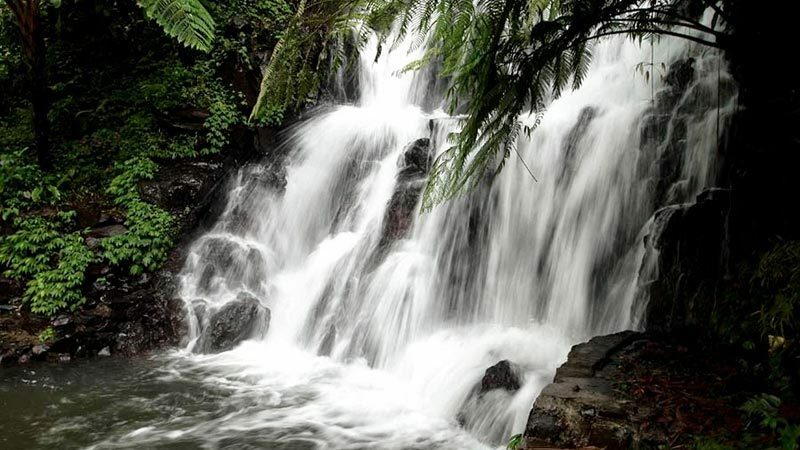 Only 2 kilometers from Sekumpul waterfall lies Lemukih waterfall with its three streams of different heights. Unlike Sekumpul, Lemukih is not well-known and there are no signs to guide you there. Although the waterfall is located only a 200 meter walk from Lemukih village main street, it might be a wisest to ask the locals for directions. Once there, you can enjoy the showers and bathe in the natural pool in total privacy. Location: In Lemukih village in Singaraja district, approximately 70 kilometers from Denpasar. 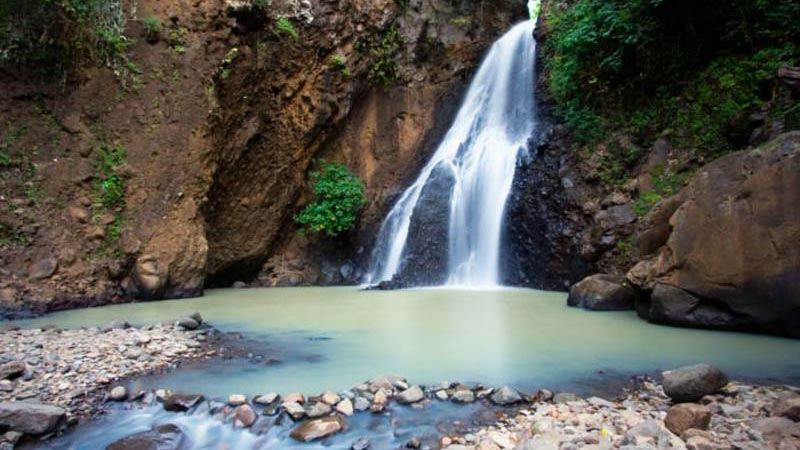 These two waterfalls are located very close to each other in Munduk village in Buleleng regency. The village is situated at an altitude of 800-900 meters above sea level so the cool air makes it very suitable for farming. 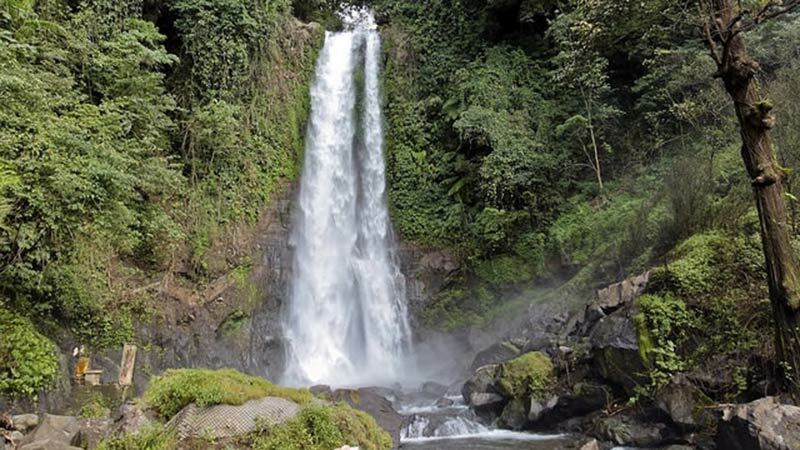 Munduk waterfall is a 15-meter tall picturesque beauty neighboured by twin lakes, and can be reached by a nice path through coffee plantations. The entrance fee is Rp. 5 000. Melanting waterfall is a short drive or around 30 minute walk from it´s sister. It is a little bit taller and offers a natural pool to splash in. 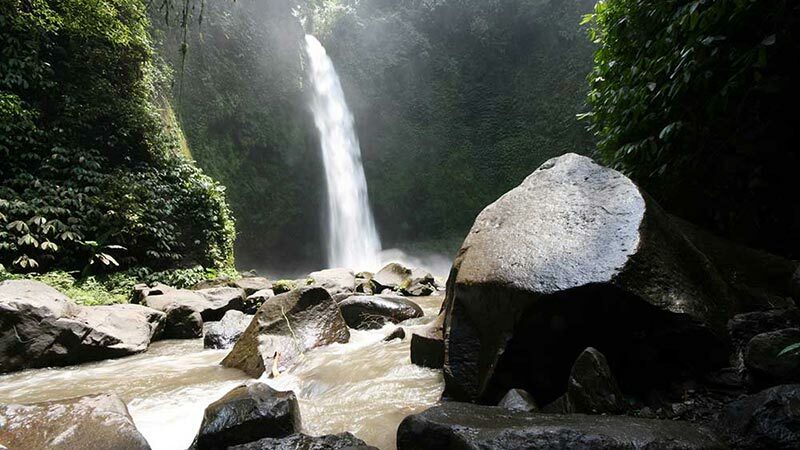 There have a been a lot of good reviews on these Bali waterfalls in Tripadvisor. Location: In Munduk village, Buleleng regency, around 70 kilometers from Denpasar and 42 kilometers from Singaraja. Yeh Mampeh, which means “flying waters” in Balinese, is one of the nicest Bali waterfalls yet virtually untouched. It is located in a small village called Les, in North Bali. For a small entrance fee of Rp. 2 500 you can hike down the falls, bathe in the refreshing waters, explore nearby caves and enjoy the views of the green hills. Location: In Les village, past Kintamani area and towards Singaraja, approximately 70 kilometres from Denpasar. There will be roadside signs for Les and the waterfall. NungNung, which lies in the village of the same name, is a beautiful 50-meter tall waterfall that requires some effort to reach. After paying the entrance fee of Rp. 3 000 you need to descend 509 steps. The journey is nice though, as you get to admire lush rice paddies, plantations and of course the waterfall itself. At the bottom of the gorge you will be amazed by the thunderous sound of the water crashing down. Location: In Plaga village, Approximately 45 kilometers from Denpasar towards Sangeh. There will be signs on the way. Blahmantung waterfall, also known as Blemantung, is a gorgeous sight that hasn´t yet become too touristy. Nestled amongst the many coffee plantations in Tabanan regency (I swear you can almost smell the aroma of coffee in the air), there are actually three waterfalls. 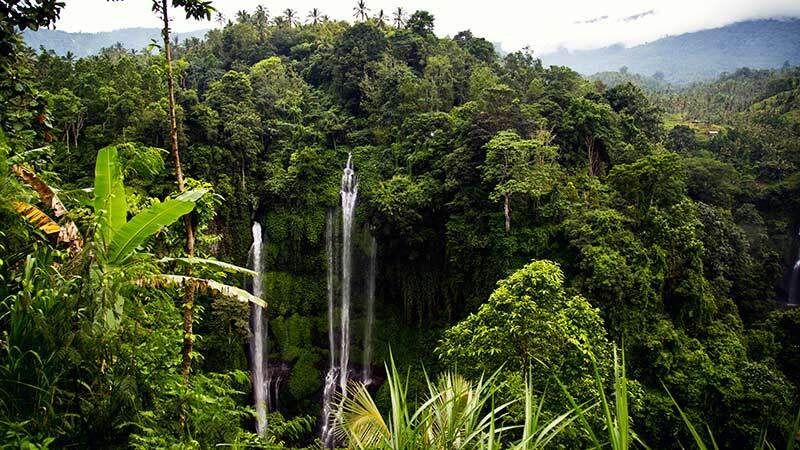 The best one is a 50-meter tall beauty (one of the tallest Bali waterfalls) hidden behind quite a difficult 800 meter trek. It´s wise to bring water with you. The rainforest air is fresh and cool though, and after your trek you can enjoy soaking in the plunge pool below. Blahmantung has gotten great reviews on Tripadvisor. Location: In Pujungan village in Tabanan regency, approximately 75 kilometers from Denpasar. The way there is well-signed. 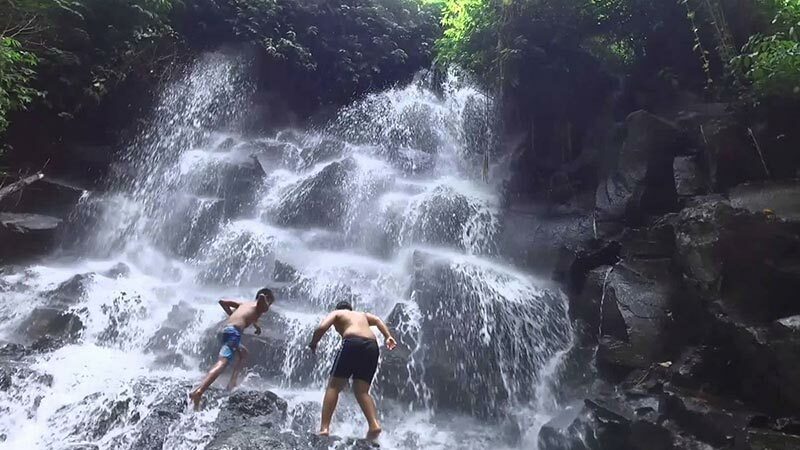 Located in Wanagiri village in Buleleng regency, Banyumala is another magnificent hidden Bali waterfall. There is a sign for it near Lake Buyan but to actually be able to find it I would suggest hiring a local guide. There are two flows cascading down the steep rocks and the surrounding nature is gorgeous; trees and ravine are all around you. You can also take a dip in the cool pool while soaking up Banyumala´s beauty. Location: In Wanagiri village in Sukasada district, Buleleng, about 55 kilometers from Denpasar. 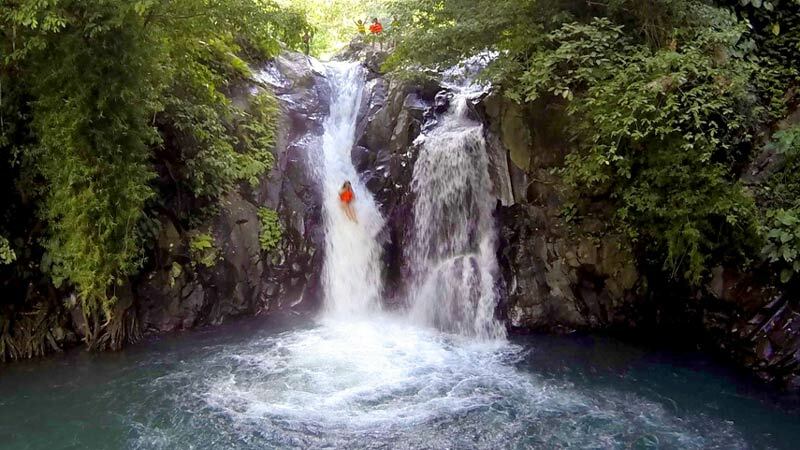 This 40-meter tall waterfall is for sure one most people have never heard of. So far it´s rarely even been visited by locals. It can be found in Duda Timur village in Karangasem regency, but you should definitely ask the locals for directions. The waterfall is surrounded by rocks and trees, the shade of which makes the air fresh and cool. Swimming is possible if you don’t mind freezing a bit. The fact that Jagasatru is considered to have a spiritual aura makes it the perfect location for meditation. Location: In Duda Timur village in Karangasem regency, about 60 kilometers from Denpasar. 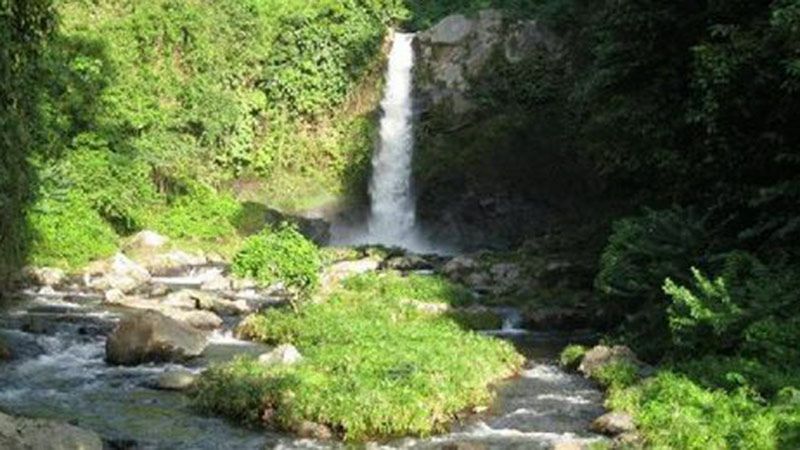 Juwuk Manis is one of the few West Bali waterfalls. It is located in Pangyangan/Manggissari village in Jembrana regency. 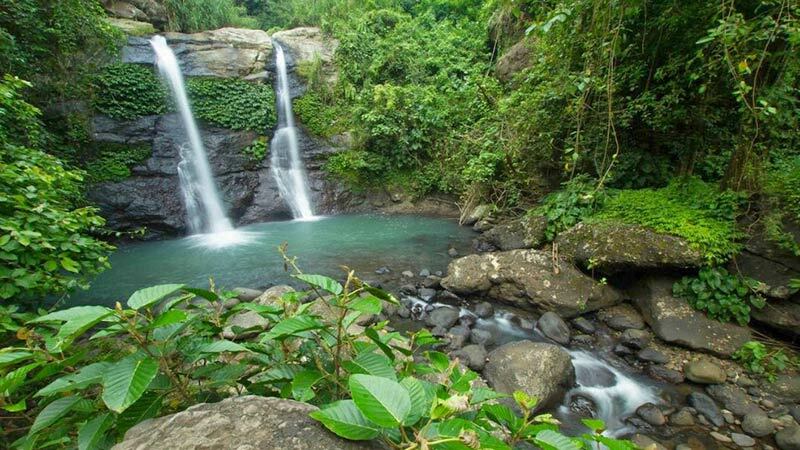 It requires some effort to reach the falls: The trail goes through hillsides, steep cliffs and coffee plantations and might be covered in overgrowth, but what awaits you at the end of the trek is a piece of paradise. The two waterfalls might not be the tallest (only 5 meters) but they are pretty much undiscovered and the waters are crystal clear and drinkable. Location: In Pangyangan village on Jl. Raya Denpasar-Gilimanuk (Negara district), approximately 70 kilometers from Denpasar. Carat waterfall consists of two waterfalls on top of each other, the tall and the small, which gives it the shape of a water jug (hence the name Carat). At the bottom there is also a small natural pool. It is located in the village of Tamblang in Buleleng regency. There is a sign instructing the way to the waterfall but the 800 meter trek might be tricky for some, what with crossing a wobbly bamboo bridge and tackling steep cliffs. The locals believe Carat to be haunted, and bad luck will come to those people who talk bad things or have a negative impact on the nature of the surrounding area. Location: In Banjar Dinas Klampauk in Tamblang village, Buleleng, approximately 85 kilometers from Denpasar. Peguyangan waterfall on the island of Nusa Penida is not your ordinary vertical torrent in a jungle. 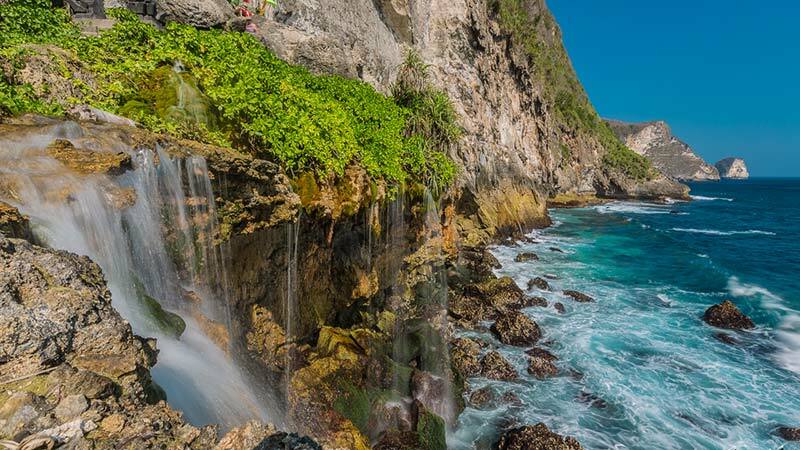 Instead the waterfall consists of short, cascading streams that bubble down a steep ravine forming natural pools and then continue into the sea. The way down to the waterfall is a steep descend down over 400 steps but it is worth the effort to be able to enjoy the fantastic seaview while bathing in the small natural pools. To find it it’s best to use a local guide or join a tour. Other waterfalls you can visit on Nusa Penida are Sebuluh (next to Cacah village) and Seganing. Location: In Batu Kandik village on Nusa Penida Island. To get there from mainland Bali you need to take a boat from either Sanur or Padang Bai.